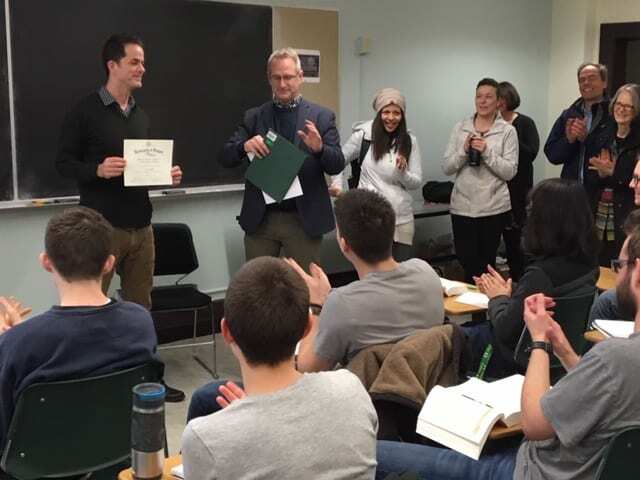 On January 23, 2019, members of CAS and Political Science surprised Lowndes and his students by dropping into his class to present him with the Tykeson Teaching Award. The award recognizes exceptional faculty who have demonstrated excellence in breadth and scope of teaching. “Joe makes outstanding contributions to the department by teaching classes across all levels, from introductory courses to upper-division classes to graduate seminars. His classes fill up quickly, and his evaluations make it easy to see why: his quantitative scores have exceeded the department mean in every regular undergraduate course he has ever offered, including very high scores in introductory courses where high evaluations are especially hard to be pull off. His qualitative evaluations routinely include testimonies to his inspiring lecturing, like the “best teacher I ever had,” “best lecturer I’ve ever seen,” and so on. Congratulations, Professor Lowndes – and thank you for all you do for the university and our students!